A solution scenario for companies that are looking to use VoIP lines but would prefer to retain their existing analogue or ISDN Telephone system and handsets. A solution scenario for companies that are looking to use VoIP lines but have concerns about what happens if the companies IP connection fails and want added resilience. A solution scenario for companies installing IP Telephone systems and wanting the option to have calls made and received via legacy lines. A solution scenario for companies with multiple offices. 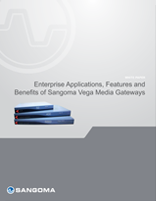 Vega gateways can be used to connect each legacy PBX to each other via the Internet, eliminating all inter office calling charges.